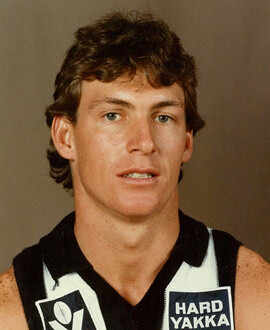 Nathan Buckley had little hesitation selecting the No.5 jumper when he arrived at Collingwood before the start of the 1994 season. Part of it was that he wanted to honour someone he admired in his early senior years – his former Port Adelaide teammate Bruce Abernethy, who wore the number with distinction with the SANFL Magpies, as well as three seasons at Collingwood in the mid-1980s. Abernethy had obviously made a strong impression on Bucks. And the impression he made on Collingwood fans was just as strong – but left them wanting more. After a slow start at Victoria Park he hit his straps in his third year, 1986, when he recaptured the dashing, dynamic form he had been recruited for, finishing sixth in the Brownlow Medal and second in the Copeland Trophy. If Abernethy hadn’t quit Collingwood – at 24 – to return home to Adelaide at the end of 1986, he might well have been a member of the Magpies’ famed 1990 premiership side. Instead, in that same year, he played in a sixth SANFL premiership for Port Adelaide. Two years later, he played in a seventh flag, alongside a young Buckley. Abernethy was an unfinished work at Collingwood, but his career in totality was anything but. He played more than 300 senior games – 190 with Port Adelaide in the SANFL, 10 state matches, 43 with North Melbourne, 58 with Collingwood and 11 with the Adelaide Crows. Described as an incredibly “intelligent” footballer with polished skills, a graceful and powerful running gait, and with a booming right foot, he was a footballer almost ahead of his time. A gifted wingman who had the versatility to also play as a running half-back, he didn’t always appreciate the attention that his football naturally brought him. He never chased media interviews (which seems at odds with his later media roles on Channel Seven in Adelaide), often preferring to often let his game do the talking. Peter Keenan, who was working at Collingwood during his time, described him as a player who “likes anonymity”, and who was “very quiet” away from the football field. In one interview Abernethy talked about how hard he worked to become the player he was and naturally enough talked himself down in the process. “I can’t do the impossible, weave around five or six players and get clear – I just run in a straight line – and I’m not like some guys who kick goals with some sixth sense,” he explained. Abernethy wasn’t a natural born Croweater. He was actually born in the small hamlet of Ouse, in the central highlands of Tasmania. But he moved with his family to South Australia at a young age, and grew up not very far away from Port Adelaide’s Alberton Oval. After a brilliant Teal Cup series as a 17-year-old, he was rushed into Port Adelaide’s senior side in mid-1979 after only four reserves games, and never looked back. He played in three successive SANFL premiership sides in his first three seasons, by which time he had signed an agreement to join North Melbourne in the VFL. Though he was a little overawed joining the Kangaroos as a 19-year-old in 1982, he showed enough talent to play in the first game of the season, even if his VFL debut was overshadowed by the first appearance of the much-talked about Krakouer brothers, Jim and Phil. Abernethy played 43 games with North Melbourne in 1982 and 1983, having more than 850 disposals across those two seasons. But the chance to reunite with his former Port Adelaide coach John Cahill, then at Collingwood, and to play once more with Mark Williams and Greg Phillips, saw Abernethy cross to Victoria Park at the end of the 1983 season. For a time, the reported transfer fee of $160,000 counted against him in terms of the weight of expectation, but it was a sign of just how much the Magpies valued him. He was solid, rather than spectacular in his debut season at Collingwood, but he still managed 21 games, highlighted with 35 disposals against Geelong in Round 7, as well as being a good performer in the club’s three finals. Sadly, they would be the only finals he would play for the Magpies. He played 17 more games in 1985, and came in for some external criticism early in his final season with the club in 1986. But Abernethy responded in the right manner, and was prolific for the remainder of the 1986 season. It wasn’t just the Magpie fans who appreciated what he did during that 1986 season. In four of his 20 games that year, he was adjudged best-on-ground by the men in white, including his 58th and final game in Collingwood colours in the last round. His 13 Brownlow Medal votes saw him finish only four behind winners Greg Williams and Robert DiPierdomenico. Then came the bombshell. Just when he seemed to be working towards his peak – at only 24 – Abernethy chose to return home to Adelaide to play SANFL football again. His return to Port Adelaide was a successful one – he played in four more SANFL flags – but it didn’t stop Collingwood from trying to lure him back. Matthews approached him again after 1987 and 1988 seasons, though it was to no avail. Even so, Abernethy did get the chance to play AFL football again. He was a part of the initial Crows’ squad and ended up playing 10 games in 1991, and a solitary one in 1992, before playing in his seventh SANFL flag with Port Adelaide a few weeks later. Abernethy was a quality footballer, but Magpie fans still have a feeling of ‘what if’ when it comes to assessing his career.